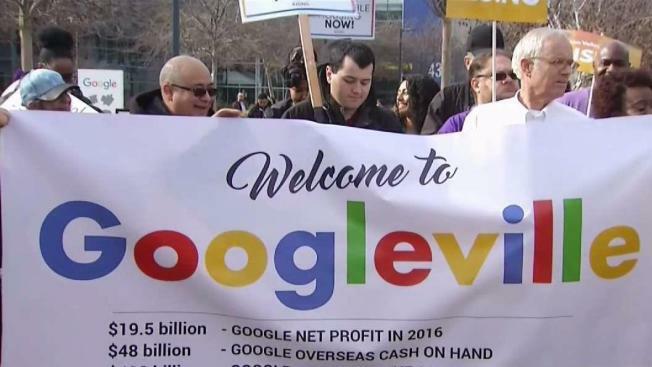 Google's plan to build a massive new campus in downtown San Jose was met with protests Wednesday at the company's Mountain View headquarters. The central issue was concern over what the tech giant's plan could mean for those struggling to afford housing in the city now. The city of San Jose is in the middle of negotiations with Mountain View-based Google about the planned new 6.8 million square foot campus. And those from a group called Silicon Valley Rising along with others who live nearby are saying don't leave them out in the cold. "We are here because our community is hurting," said protester Maria Noel Fernandez, who was among a group marching outside Google headquarters to deliver their message. "If they're gonna come to San Jose, they are welcome. But they need to come and be a responsible neighbor," another protester said to the crowd. The group is asking Google to come to the table to help with, among other things, affordable housing, and legal representation for those who might lose their homes because of rising prices. "We have asked them to come to our town halls, we've invited them to our meetings, and they haven't shown up," Fernandez said. "So we're saying, we're coming to you if you won't come to us." While Silicon Valley Rising delivered a letter outlining its requests to Google, the pro-business Silicon Valley Leadership Group urged residents to welcome the tech giant and the benefits it can bring. "First, we have an iconic company like Google, who wants to invest 20,000 high-tech, high-wage jobs right in downtown San Jose, where it belongs," said Carl Guardino, president and CEO of SVLG. Google released a statement saying it plans to work with local officials to benefit both the city of San Jose and those who live there.